Chemical treatment or oxidation is a technique used to remediate certain types of environmental contamination either below the ground surface (in-situ) or post-extraction (ex-situ). Strong chemical oxidants, such as sodium permanganate or potassium permanganate may be applied to a contaminated site to destroy the contaminants. Other chemical treatment techniques include the use of peroxide, ozone, or oxygen mixtures. At NES we have integrated various chemical treatment technologies with our remediation systems. NES does not provide bulk treatment chemicals but we will assist clients with chemical delivery designs, material compatibility, and pump selection. Although not generally considered toxic to humans, Iron can be “toxic” to many treatment system components. It is also regulated when securing a NPDES permit. At National Environmental Systems we have provided small scale iron treatment solutions as well as full scale integrated iron removal systems. Please visit our helpful links for more reference information on these techniques. 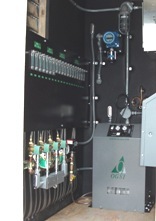 Oxygen Injection with Manifold & LEL Meter.